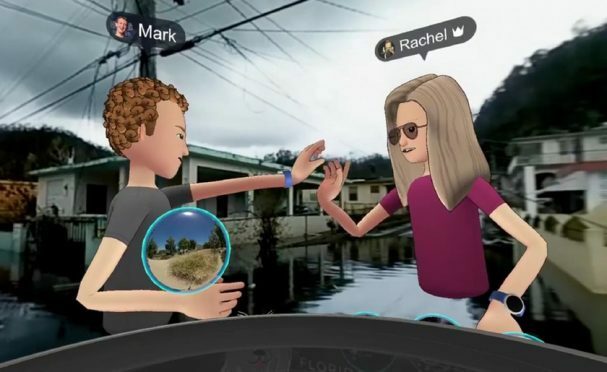 Along with the head of his social VR team, Rachel Franklin, Zuckerberg’s cartoon avatar teleported between the roof of one of Facebook’s buildings, to Puerto Rico, before ending up on the moon, to demonstrate the new feature. “Let’s go quickly teleport there,” he said in the video, before hopping “into” a 3D video made by NPR in the island which has just been hit by Hurricane Maria. “You can get a sense of some of the damage here that hurricane…that the hurricanes have done,” said Mark, appearing to have forgotten the name of the category four hurricane that killed at least 34 people. The pair later high fived. “Crazy to feel like you’re in the middle of it,” added Rachel, before the pair were transported to a 360 degree image of its Oculus Connect conference from last year. Aside from the usual requests for jobs or cash under Zuckerberg’s posts, some were not impressed. “Is this a joke?” asked another. Zuckerberg has since responded to criticism in the comment section of the Facebook Live video. “One of the most powerful features of VR is empathy,” he wrote. “My goal here was to show how VR can raise awareness and help us see what’s happening in different parts of the world. I also wanted to share the news of our partnership with the Red Cross to help with the recovery. The company is working with the American Red Cross on AI that will create population maps to show where aid is needed, and has also sent Facebook employees to Puerto Rico to get people back online.